Living in Melbourne, food markets to me are a dime a dozen. Well… that was until I recently met London’s Borough Market on a two-week Euro holiday. I was smitten! I’m a little bit embarrassed that a few fresh juice cups, sizzling vats of chorizo-filled paella and the sight of a gazillion strawberry punnets made me so deliriously love-struck. Yet no sooner had I arrived, I was skipping around Borough Market, unable to rub the smile off my strawberry-smeared face. 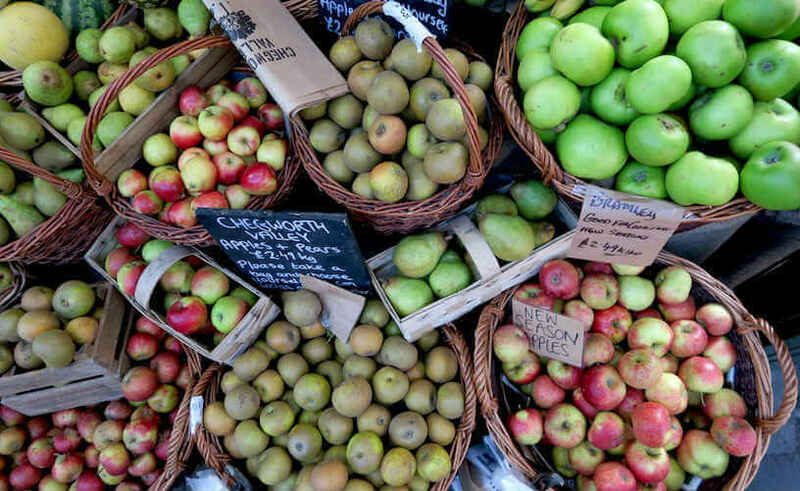 Borough Market is tucked into a pocket of Southwark, which is just south of the River Thames, conveniently located next to London Bridge tube station. 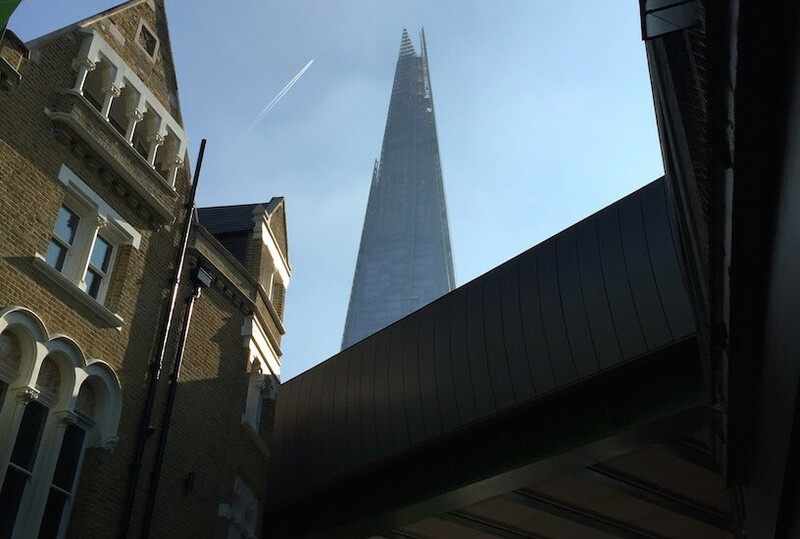 Look up, and you’ll see train lines and London’s tallest building, the spaceship-like Shard, looming overhead. This all-things-food market is quite old, with the area being known for the trading of produce since the 11th century, which is a whole 700 years before Australia was ‘discovered’. 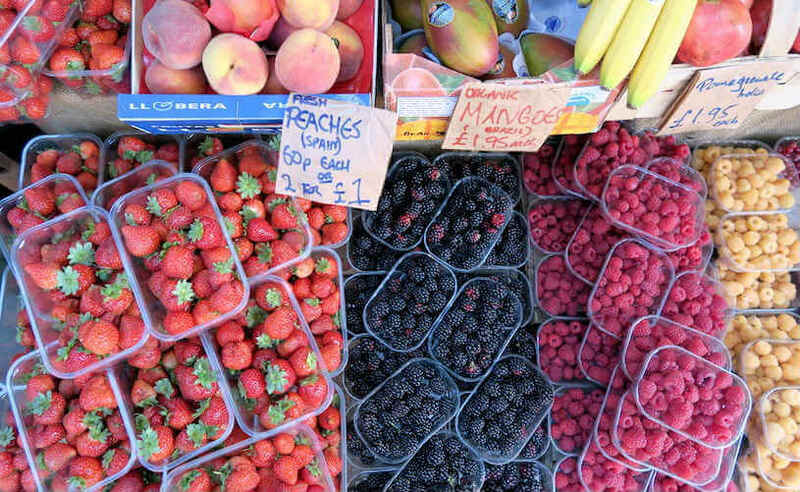 History lesson aside, the market’s popularity among Londoners and tourists alike is undeniable. Open Wednesday to Saturday (plus Monday and Tuesday for lunch), the market can be as crowded and chaotic as David Jones on Boxing Day. Fortunately for me, Friday morning proved quite a peaceful time to visit with very few line-ups. The elaborate shed-type complex is home to 100+ stallholders, all of which are selling a rainbow of fresh food products. 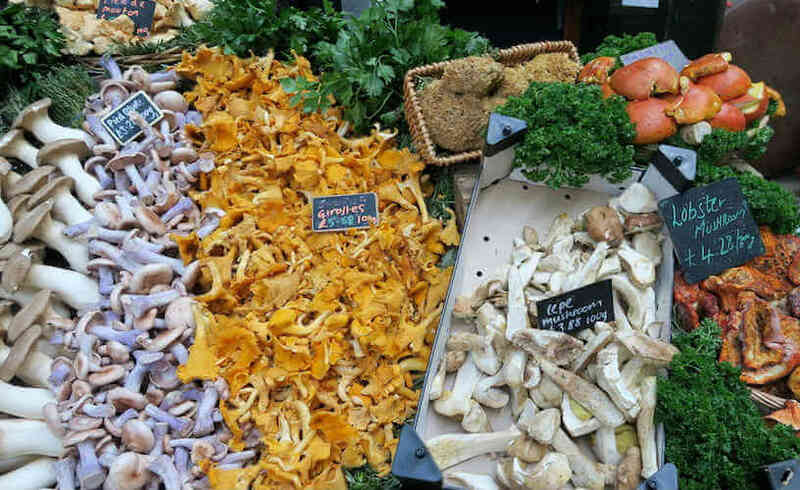 Think home-grown vegetables, meats, seafood, artisan pastries and bread, wines and ciders, chocolate, tea and coffee and more types of mushrooms than I knew existed. Who has ever heard of the Lobster Mushroom?! You’ll discover all types of cheeses and finds like truffle oil, plus there are so many pork pies that it would have brought grown-man tears to my grandpa’s eyes. Then there’s the fruit, which comes in some mind-boggling varieties; from apples, pears and dragon fruit to fruit cups and fruit juices of all flavours. You can bet your market basket that you’ll find something that peaks your appetite and interest. The only problem I had was working out how I could get a suitcase full of fruit through Melbourne’s customs. 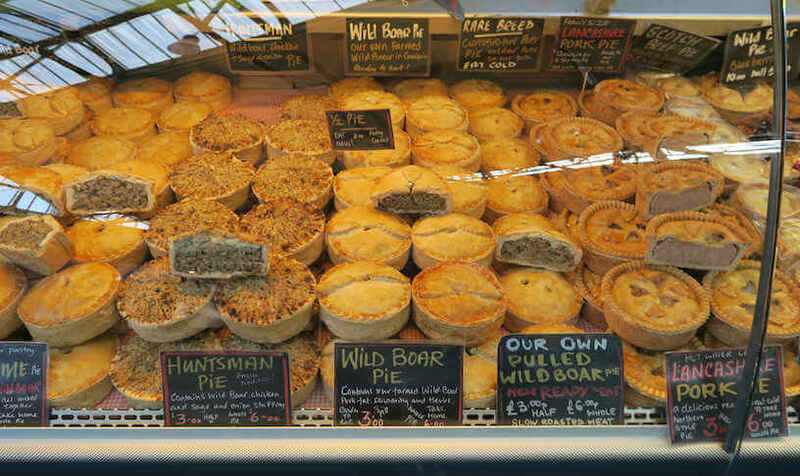 If like me and customs is a slight hiccup in being able to splurge on perishable products while overseas, there’s plenty of options to eat on the spot, with hot food traders cooking up a storm of soups, pies, kebabs, gourmet hot dogs and sausages. No sooner had I had breakfast (a deliciously YUM bacon and egg roll on fresh, crusty bread that was all only £4.50), the smells of lunch being fried up got the better of me, and I began behaving like some petulant child asking if it was lunchtime yet. London is flipping expensive! Cashing in Aussie Dollars was like peddling potatoes in Russia. Worthless. Where I had become accustomed to spending A$10 on a takeaway latte, I found Borough Market prices to be quite reasonable, sometimes cheaper than what I’d pay at Prahran Market (after doing a quick currency conversion). Husband, known as Jude, also randomly got the haircut of his life at Borough Market, and given he doesn’t have a lot of hair that’s special. For the entire trip, Jude desperately needed to get his hair cut, resembling some kind of Angora rabbit in all of our travel pics. So two days before we were due to get on a plane and come home, he decided it was time to donate the hair to the floor. Which was all quite perfect, because it left me to stroll through the labyrinth of market alleys in my love-struck daze. If travelling by tube, the best station to get off at is London Bridge, confusingly not Borough Station. For some of London’s best coffee, head straight for Monmouth Coffee, located across the road from the market – you can’t miss the line up of crazy coffee lovers. 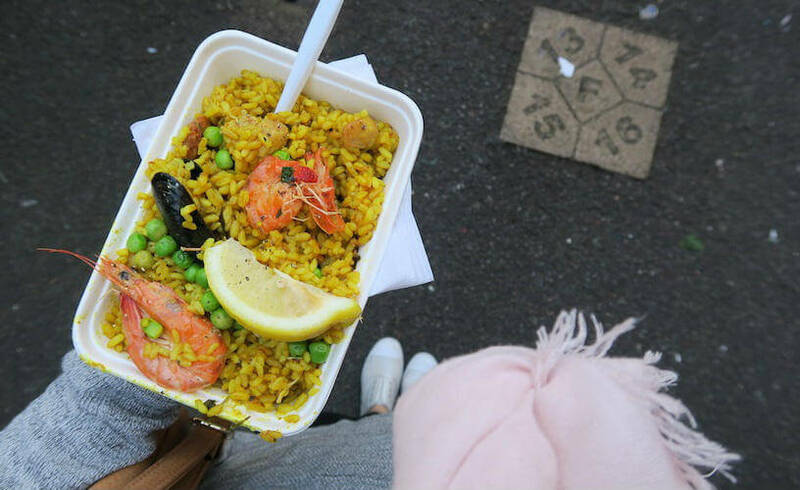 From paella and sausages to cheese and wine, lots of stallholders offer free tastings. 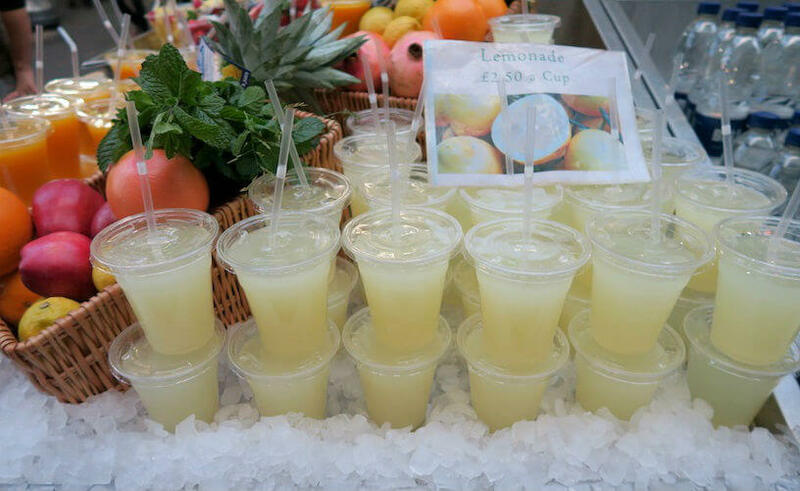 If the weather’s good, the gardens of nearby Southwark Cathedral are a peaceful spot to enjoy your market loot.